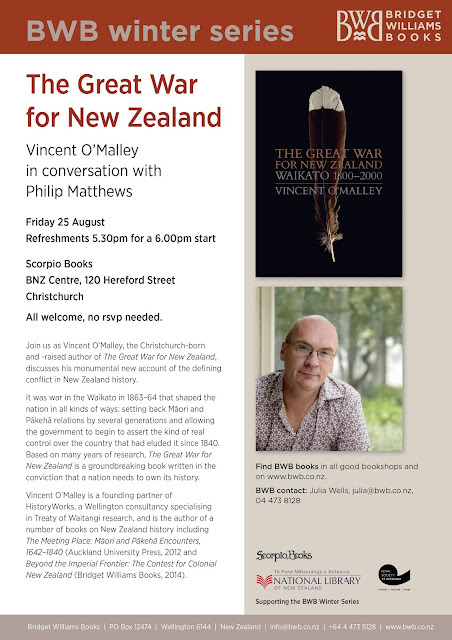 A reminder that tomorrow night I will be discussing The Great War for New Zealand with Philip Matthews at Scorpio Books, BNZ Centre, 120 Hereford Street, Christchurch. Refreshments from 5.30pm for a 6pm start. For those not able to attend, RDU 98.5FM will be live streaming the event in full over Facebook. Click here for the link. By way of a taster, this morning I talked to James Dann, host of RDU's breakfast show, about the book and tomorrow night's event. Take a listen here. See www.facebook.com/events/871154789709189/ for more details.